Most of you have heard of a Limited Liability Company or LLC. A cross between a sole proprietorship or partnership and a corporation, LLCs acts as a shield protecting your personal and business assets from liability in the event of a lawsuit. The Series Limited Liability Company, or SLLC, takes it a step further. What is a series limited liability company? Well, the premise behind a Series LLC is to for separate entities to operate and do business autonomously and free from the liability of those in other series. Assets and accounts are segregated, and each series operates under its own name. For example, if “Series 1” manages real estate and “Series 2” owns a restaurant, Series 1 would be protected if Series B was involved in litigation. Because the series is under the main company, there would only be one filing fee and the series could be created and deleted without further filings needed. Also, each series could operate under its own type of ownership. 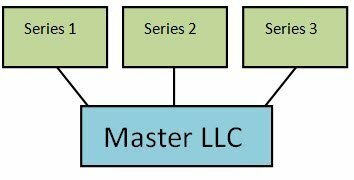 Series 1 can be a sole proprietorship, Series 2 a partnership, etc. Depending on the type of business interests each series hold, choosing how to operate to maximize tax benefits and ensure proper protections. In 1996, Delaware enacted legislation that allowed liability segregation. The first state to do so, Series LLCs were originally referred to as ‘Delaware Series LLC’. Over the last two decades, Series LLCs have become more widely used and accepted. 12 states, including Delaware, Nevada, Tennessee, and Texas currently allow the forming of Series Limited Liability Companies. The District of Columbia and Puerto Rico are also on that list. Though not all states allow an SLLC to be formed in their jurisdiction, a series LLC can be registered and do business within another state’s jurisdiction. The increasing popularity of SLLCs as a business model has been reflected in legislation over the years. Delaware, for example, has decided that through a series can do business, they aren’t explicitly recognized as separate entities. Illinois is less than generous, forcing each entity to publicly file and be designated by the Secretary of State. There are Do’s and Don’ts to operating a Series LLC in order for each series and the company as a whole to be free from the liabilities of another. Each series must maintain its own finances and keep it separate from the others. No co-mingling of series assets with one another. Series’ can do business with one another, but there needs to be a clear contract acknowledging each series as its own. Individual series must do business under their own respective names to further emphasize their separation from one another. Any contracts entered into by a particular series, must be signed and documented under the name of that respective series. For example, “XYZ, LLC, Series 1”. Series LLCs are popular among real estate investors. Each property can be owned by a different series offering protection from an investor having all of their properties attached during litigation. Series LLCs also create a way for IRA owners to hold and manage real estate within their retirement vehicle. Saving money of management and custodial fees and getting the tax breaks that come along with having your money and assets in an IRA. Series Limited Liability Companies may become the way to do business in the 21st century. The benefits of creating an SLLC are attracting more and more business owners and investors. This is sure to draw the attention of lawmakers in the coming years so one must be aware of impending changes to current legislation governing the operations of Series LLCs. Tax laws in particular. As local, state and federal governments weigh in. But for now, use the advantages to your benefit.